Installing time tested solutions that will drain your garden solving waterlogged lawn and soggy muddy garden drainage problems even on clay soil. Have you got a soggy waterlogged lawn or garden that holds surface water making it muddy? And what you really really want is a lawn the kids can play out on, without bringing saturated mud into the house. This is how we drain surface water from your garden and lawn. First we will arrange to meet to see and discuss your garden drainage problem. Make an assessment as to whether our French drainage system (installed below the surface described below) will dry out your garden and outline the work involved. About us. We are garden and lawn drainage contractors specialising in draining domestic gardens, solving waterlogging, soggy lawns, boggy soil and surface water problems with solutions that work, even on clay soil. In most cases without major hard landscaping or raising garden surfaces. We have not suddenly appeared as a reaction to recent flooding of the Somerset levels and Thames valley or recent record rainfall, we have been installing French drains for many years, both as a necessity and for the past 10 years as a business. We know what we are doing, we can fix it. What causes water logging and surface water puddling problems? There are several causes for poorly or slow draining spongy soil, it is a common problem, not just for homes and gardens built on low lying land, floodplain, clay or compacted soil. Structures you or your neighbour have added, like retaining walls, footings for extensions and swimming pools can all divert surface rain water and underground springs, causing water logging. Probably one of the worst culprits are the old-fashioned non-permeable patios and driveways constructed off printed concrete. What can I do with my flooded garden? A lot of time and money can be spent trying to trace the source of the problem, leading to disputes with neighbours, surveyors, the builder who built the extension the landscaper who installed your patio and retaining wall, without considering the effect on garden drainage. The only way to fix it is to drain the water away from your lawn and garden. How to drain a garden. This is the system we recommend and install on waterlogged clay based soil. Based on French drains, its installed under the existing turf or garden topsoil and solves water logging and other garden drainage problems, its easily the best drainage system for clay gardens. The drainage system takes about four days to install and the garden starts to drain immediately. Why put up with a lawn the kids can't play on and mud you can't plant in. The problem won't just go away. If lawns are waterlogged over the whole area, a French drain installed in a Herringbone pattern is your best bet. Mark out and dig the main trench from the highest part of the lawn, to the lowest part. Connect to a Soak away, Sump, or Surface water drain. 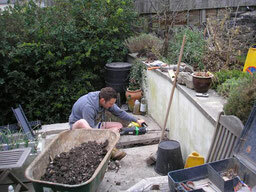 Then mark and dig out the side trenches to connect to the main drain, forming a herringbone pattern. The side drains join the main drain at a 45 degrees angle and are spaced at 10 ft intervals for clay soil and 25 ft intervals for loamy soil. Fill the drains with wrapped gravel. I/e line the trench with A heavy duty landscape fabric, for sale in the drainage shop, to keep earth out of the gravel and allow water to percolate freely through the gravel, then shovel coarse gravel onto the landscape fabric and wrap the fabric over the top of the gravel. .........Ever since the Romans used them to solve drainage problems, not much has changed, perforated plastic pipes (holes at the top or bottom, depends on who you ask ) came and went, French drains still work. Why are they are called French drains? Although stone drains date back to the Ark, they are actually named after an American, Henry French a 19th-century judge, gardener and farmer. Soak away or Sump or Drain? At the lowest end of the main trench dig out a soak away at least four feet deep filled with chunky gravel or clean rubble and link the main drain to the soak away. After installing French drains it's important to spread grit sand and aerate the surface. Aerating the whole area, including over the trenches, ensures surface water drains from the surface into the soil and drainage system. In most cases laying a new turf lawn over the completed drainage system won't be necessary, the drier grass will recover and the trenches can be seeded over, but it is important to spread grit sand over the whole lawn. Leave the tips of the grass showing and aerate. Hard work, but you will end up with a level well drained lawn that's nice to walk on. See the lawn care tips on the landscape gardeners page. I can sometimes offer a lawn turfing service in all areas of Southern England, where we have installed land drainage systems. this is the drainage system that removes the waste from the toilet, bath, sinks, washing machines, dishwashers and showers and you will need permission from the local council. this is the drainage system that deals with rainfall from your gutters, etc. In gardens that slope away from the house, it may not be possible to connect the gravel drains directly into the surface water drainage system and the rain water may need to be drained into a sump and pumped. I have included some basic information on the drainage sump and pumps page. Also some other drainage systems you may want to consider. Hampshire, Surrey, Berkshire, Oxfordshire, Gloucestershire, Buckinghamshire, Wiltshire, Midlands, South Wales, West London, North and Central London, Bristol, Somerset, Devon, Dorset. What won't fix a waterlogged garden. Soakaways are unlikely to work in clay soil. If after you have dug out the soak away, you find the water is not draining away, you will need to look at either connecting into the surface water drain system or where this isn't feasible, converting the soak away into a sump and pump to pump the water away. Raising the surface without an escape route for the water could create one big soggy bog garden. Cost of garden and lawn drainage. How much will installing a Garden drainage system cost? The average cost of French drain installation in the UK is £3180. The fee is paid on the day and refunded if we carry out the drainage work. The meeting to discuss a drainage solution will take about an hour and includes on the spot assessment and advice. Followed up with a quote describing the work to be carried out by us or a contractor of your choice. The cost for me to carry out the drainage installation. The quote can be used for D.I.Y or the cost refunded if I carry out the work. The guide will be useful to both D.I.Y home owners and landscape contractors wishing to install land drainage. It is an easy to follow guide that includes, telephone back-up, marking out, materials and a formula to calculate the gravel to fill the trenches. The drainage guide only costs £10.00 and can be purchased here. I just wanted to get in touch to let you know that despite the dire weather we've had since you installed drainage for us back in April, it has been working fantastically. We are so pleased - it has worked even better than we hoped it would. We no longer have to wear wellies and run the risk of sinking in a bog every time we venture outside! With any luck we may even get some summer soon and be able to actually sit out there! The other thing is we found a steel flask in the garden that one of you left - I washed it out and put it to one side to post but forgot - have just rediscovered it! Do you want me to post it back to you, or are you back in Cardiff anytime to pop in and collect it? Let me know what's best. Thanks once again. We will gladly recommend you to anyone needing drainage work done in future. Louise Name and address supplied. The drainage guide costs £10.00 and can be purchased here. How to install garden drainage. Testing a waterlogged garden. . Solving soggy, waterlogged lawn and garden problems yourself. Draining the rain water away. What will solve saturated soil problems ? What are the main reasons for poor garden drainage problems? Soakaways on clay soil Herringbone drainage. . These are the towns and counties we install garden drainage in the UK, Bristol, Somerset, Devon, Wiltshire, Berkshire, Dorset, London, Surrey, Gloucester, West Midlands and South Wales. Cardiff, Newport, Swansea and South Wales. Abinger Hammer | Addlestone | Alfold | Ashford | Badshot Lea | Banstead | Belmont | Blackbrook | Blackwater | Bookham | Brook | Bucks Horn Oak | Capel | Caterham | Cheam | Chessington | Chipstead | Churt | Cobham | Compton | Countywide | Crondall | Dockenfield | Downside | East Horsley | Effingham | Elstead | Enton Green | Esher | Ewhurst | Farnham | Fetcham | Frimley | Gatwick Airport | Godstone | Guildford | Hampton | Hampton Wick | Haslemere | Hindhead | Horley | Hurstpierpoint | Kingston upon Thames | Knaphill | Leigh | Lingfield | Long Ditton | Mayford | Milford | Morden | New Addington | Newdigate | Ockley | Oxshott | Peaslake | Pirbright | Purley | Redhill | Richmond Upon Thames | Ripley | Sanderstead | Shamley Green | Shere | Staines | Sunningdale | Sutton | Tadworth | Teddington | Thornton Heath | Tolworth | Virginia Water | Walliswood | Walton-on-Thames | Warlingham | West End | West Molesey | Westhumble | Windlesham | Witley | Woldingham | Worplesdon | Wrecclesham.